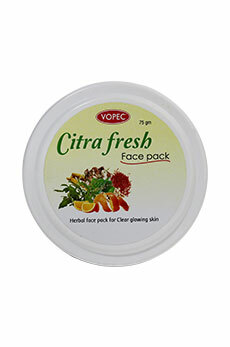 Citra fresh is a herbal face pack, made with highly effective herbal ingredients. Its aromatic & cooling nature provides relaxing effect to smooth facial skin. 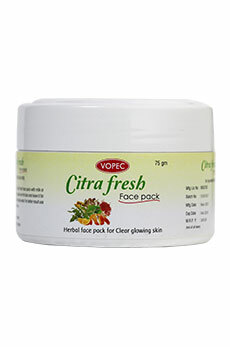 Citrafresh improves complexion and controls sebum secretion and blocking of skin pores. Anti- oxidant nature of its unique herbal ingredients removes skin tanning, black spots and revives youthful and supple face. Mix 2 tsp of Citrafresh face pack with milk or rose water. Apply this paste over the face and leave it for 15minutes.Then wash with plain water. For better results use this face pack every week regularly. Fights with free radicals and prevents wrinkles. Avoid using chemical products on your face. Wash the face frequently with plain water without using soap.